How do nurses become e-nurses? At RCN Congress in June, delegates agreed to a motion calling for all nurses to be supported to become e-nurses. But what does being an e-nurse mean, and how should nurses ensure they can become one? According to the RCN, to become e-nurses all nurses should be able to access the information they need to do their job. This could mean access to the right IT, the training to use it, and the skills to collect and apply data to improve care. The Department of Health and the NHS agree that more nursing work should be digitised, and there have been several reports and a surge of funding to boost the use of IT in the NHS. The NHS Five Year Forward View, published in 2014, called for an information revolution in the health service. In the same year, the National Information Board announced that, by 2020, professionals and carers should be able to access real-time digital information about patients. 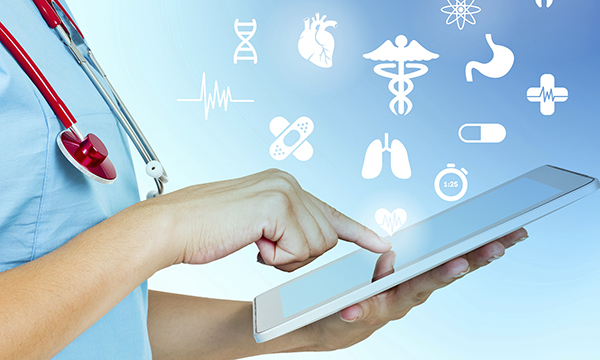 This move towards a paperless NHS is discussed in the document Personalised Health and Care 2020, which points out how the health system has lagged behind other industries in the use of IT. In the airline industry, for example, 70% of flights are booked online and 71% of travellers compare more than one website before purchasing. About 95% of tickets are issued digitally as e-tickets, and more than 22 million adults use online banking as their primary financial service. Earlier this year, the Treasury allocated £4.2billion to digitise the NHS, and the Wachter Review into the role of IT in the NHS calls for more clinicians to become IT experts. This review, which was published in September, calls for ‘a major effort’ to place well-qualified clinicians with advanced informatics training in every trust. Sharon Levy, programme director for nursing studies at Edinburgh University, says the potential benefits of improving the use of IT in the NHS are huge. ‘The NHS and other healthcare providers are looking to reduce waste, and to offer effective and efficient services,’ he says. One problem, Mr Levy says, is that while nurses are confident in using social media and online services at home, they are less confident in using the same skills at work. He says that this is partly due to a culture of suspicion and fear about the risks of IT in the health sector, which prevents people from realising its potential to improve services. In some cases, people delegate the use of IT at home to their children because they do not feel they have the necessary skills. ‘I want nurses to be bold and creative,’ he says. ‘I want them to explore, but I fear that in teaching digital skills we emphasise the risks. At Congress, district nurse Vicky Smith related a tale of IT failure that will be familiar to many nurses. She explained how laptops and smart phones used by her team do not work properly if signals are poor or batteries are low. ‘Try using a laptop sat on your knee in front of a steering wheel,’ she told the event in Glasgow. One reason for this is that too much IT is designed solely for the use of doctors with little input from nurses, Mr Levy says. Annette Gilmore, head of clinical and patient assurance at the Professional Records Standards Body, agrees that the NHS has not always invested enough in ensuring that tablets, phones and other devices are well used. ‘Hospitals often spend money on hardware, but not on all the equipment and support needed to make it work correctly,’ she says. She urged nurses to think about the kinds of technology that would enhance their services. While IT gets increasingly complicated, she says, the principles of safe usage remain the same. Nurses need to articulate how technology can support their practice, and work for them and their patients. Lenka Chenchara, an immunology nurse specialist at Great Ormond Street Hospital in London, is currently trialling the use of IT to help parents treat their children at home. She is supporting parents to administer subcutaneous immunoglobulin infusions to their children using Skype. Families usually undertake two training sessions at the hospital followed by a Skype session at home. This allows children to make fewer visits to hospital, reduces travel time and costs, and allows parents to access ongoing support from nurses. ‘We used to undertake home visits, but there is no capacity to provide them in the current healthcare climate,’ Ms Chenchara says. What do I do and how can these devices help me do it better? Critically assess what your team does and identify dependencies, workflows and patient pathways. What are the physical circumstances of my team? Ensure mobile communications allow work to be conducted efficiently and safely, and that applications work in locations such as the community or remote sites. What types of information do you require to do your role? Always enter information once and share it appropriately. Different grades of nurses and midwives have different information needs. Can I view and analyse data? Make sure you know where recorded information is stored and how to retrieve it. Ensure it is available wherever it is needed to avoid re-entering it elsewhere. You should be able to export the data easily. Do I have the knowledge and training to use the equipment safely and effectively? Ensure your information governance training is up to date. Check that there is a contingency plan if the technology fails and normal business cannot continue.